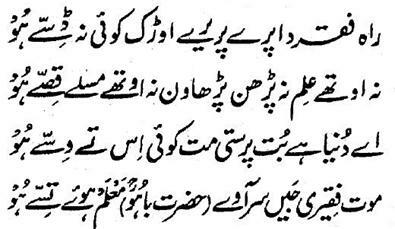 Here Hazrat Sultan Bahu Rahmatu-Allahe Ta-aala Alaihe says that 'the Destinations and Maratib of Faqar are countless and boundless. It has no entirety. Neither there is Ilm nor is there teaching and learning nor are there issues and tales. Engagement into Dunya (World) is true idolatry. One should not rely on Dunya (World). The practice of Faqar is a virtual death during life. Only he understands this, on him this death comes!